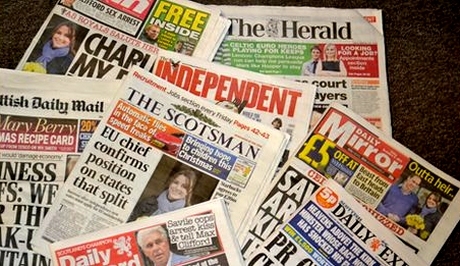 The Guardian’s daily sale in Scotland: 8,700 copies and falling. What a distance to fall. Newspaper sales figures in Scotland now come out in a patchy and unco-ordinated sort of way, with different frequencies and at different times of year, so we thought it’d be worth collecting them together for easy reference. The numbers below are the most recent figures for each title that we know of – for papers classed as “national” that means November last year, and for those counted as “regional” (which includes the Scotsman and Herald titles) it’s this month. Figures have all been rounded to the nearest 100, and increase/decrease stats refer in all cases to the corresponding sales for one year previously. 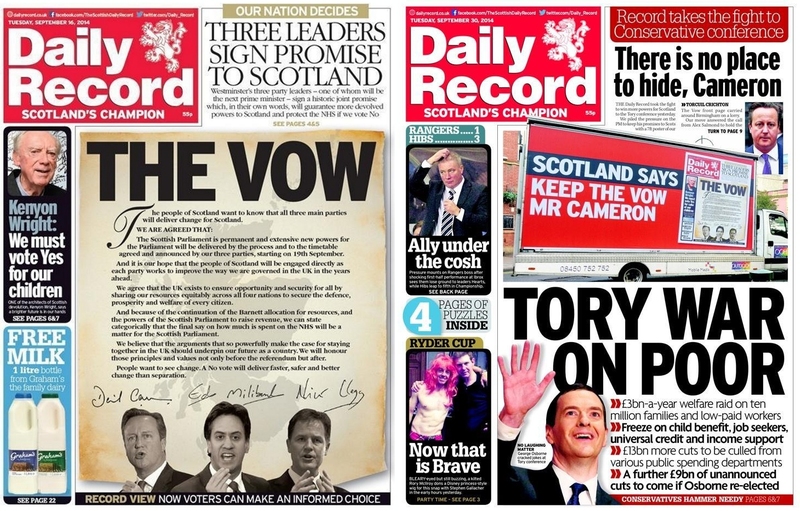 It’s been a fair few months since we last documented the Daily Record’s increasingly panicky attempts to save its own hide over its infamous eve-of-referendum “Vow”. In its growing desperation, the paper bizarrely turns today to First Minister Nicola Sturgeon, demanding that SHE should be the one to fulfil a promise that the Record made specifically in order to thwart Sturgeon’s lifelong goal of independence. Alert readers might feel that a few lines have gone missing somewhere between paragraphs four and five. And the fact that they have has nothing to do with dead football clubs, and everything to do with the dying Scottish media. We don’t follow many Unionists on social media, because you end up wasting your day arguing pointlessly with a lot of people who are never going to change their minds and getting in a bad mood. But we’re told they were all very excited about an article in yesterday’s Daily Record. 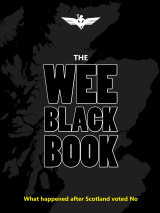 Penned by the paper’s political editor Davie Clegg, it’s a long diatribe about how the fall in oil revenues has created a black hole which now means Scotland is – stand by for a surprise! 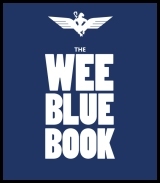 – too wee and too poor to be independent. So far so meh – it’s not like it’s the first time we’ve heard that record played, after all. But as you can see from the image above, there’s also quite an interesting challenge printed in giant capitals at the foot of the page. 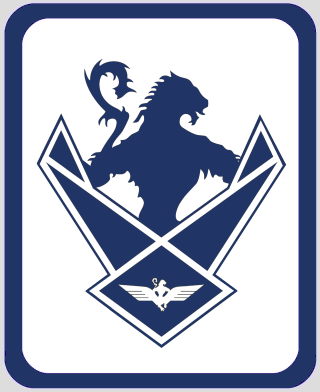 We’re not in the Scottish Government, but it’s a rainy Saturday so we thought we might have a go. The newspaper is a fantastic concept. 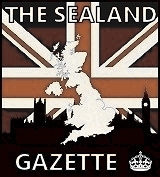 A cheap, accessible product, it’s a brilliant way of keeping yourself broadly abreast of current affairs. You turn a page and are presented with a diverse selection of interesting stories, often on subjects you’d never have thought to go and seek out in the self-refining echo chamber of the internet. This site has never believed that the ongoing steep decline in newspaper sales is a fundamental problem with the format. 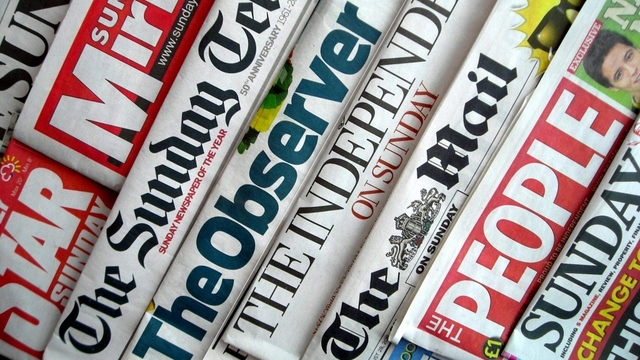 Rather, the truth is that people stop buying papers because they’re full of garbage. 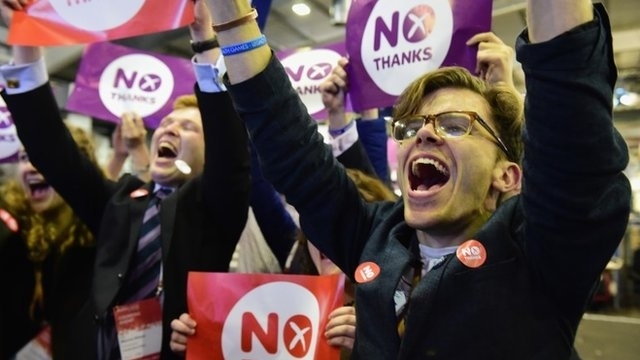 All five of the opinion pollsters who regularly poll on Scottish politics (Panelbase, YouGov, TNS, Ipsos Mori and Survation) have now published surveys in the past two weeks asking the independence question. So it seems reasonable to expect there’ll be no more polls before the anniversary of the referendum on Friday. 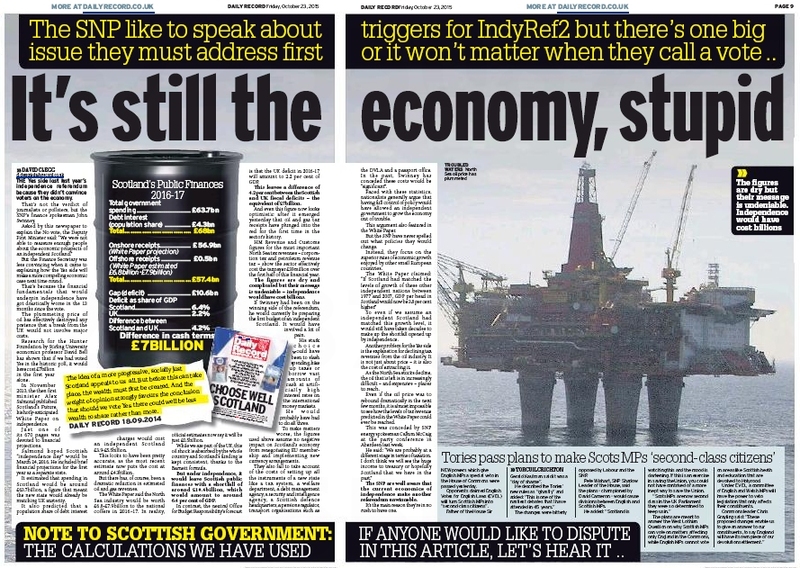 Given the conventional wisdom that the economy, underpinned by that pesky volatile oil, was the main reason not enough Scots could be persuaded to take the leap into self-government, readers might expect that the dramatic collapse in the oil price since last year (when we checked today it was trading at just over $47 a barrel, less than half the $97 it was at the start of September 2014) would only have cemented voters’ feeling that they made the right decision. So why is the opposite true? You might not think it, readers, but even after all this time we’re still capable of a certain degree of innocent, naive trust in Scottish journalism. 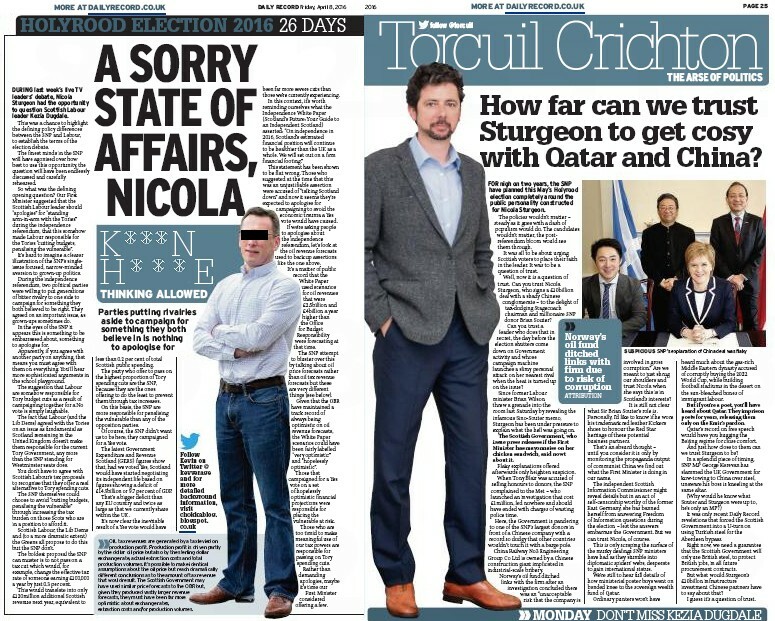 When Nicola Sturgeon didn’t just issue a boilerplate condemnation at FMQs yesterday after ludicrously overblown allegations of Twitter “trolling” by an SNP candidate, but went on the counter-attack over Labour’s grotesquely abusive Ian Smart, we foolishly thought that might make both sides of the story newsworthy. And then we opened the papers. We don’t expect the media to be impartial. But let there today officially be an end to even the slightest pretence that it’s at least fair, professional and honest. Because nothing scares Etonian Tory Prime Ministers like a poster on a van. Your time is over, Daily Record. Tick tock. 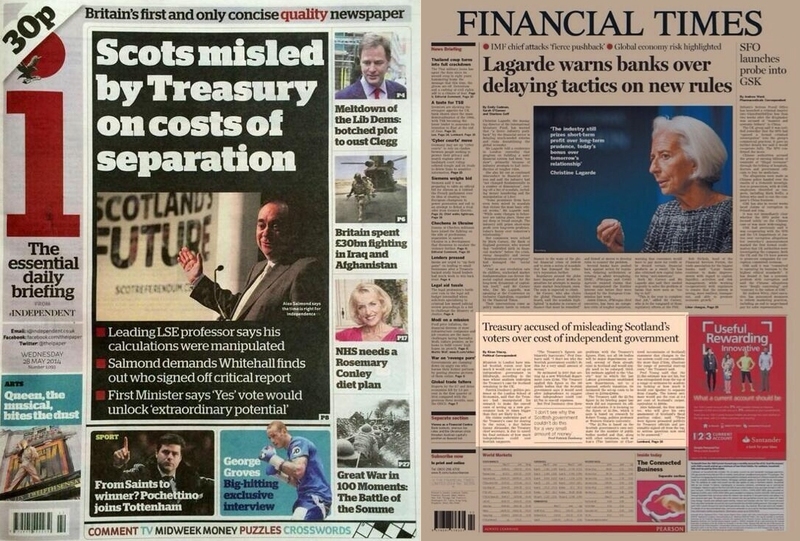 It’s not often that you see the same story on the front page of the i and the Financial Times. It’s even rarer – in fact, perhaps unprecedented – if that story’s about Scotland, because the otherwise-admirable mini-tabloid is barely even aware that there’s a part of the UK north of Newcastle. So when it happens, you know it must be a pretty darned significant story – one which the Scottish press will be all over like a swarm of wasps at a jam-factory picnic. Right? 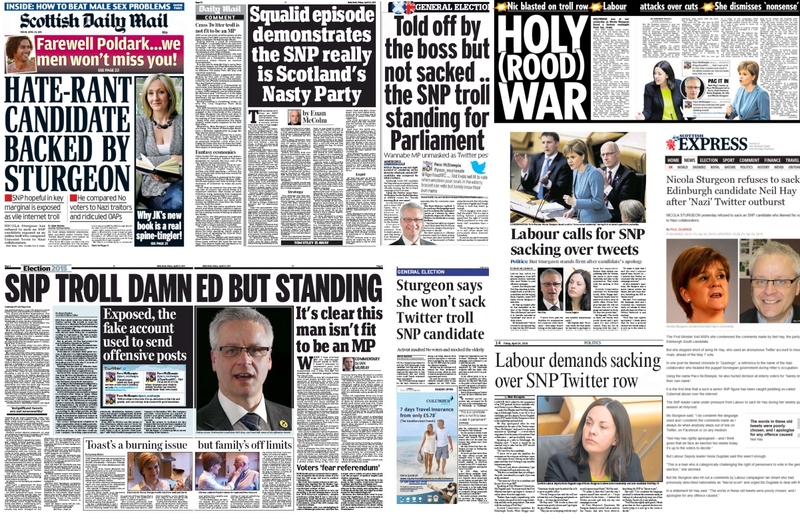 We think we might have just worked out why Scottish newspaper sales are in irreversible decline, readers. It’s because if you buy the papers for about two weeks you can just keep them in a drawer, bring them out a few weeks later and read all the same stories again without having to pay for them twice. 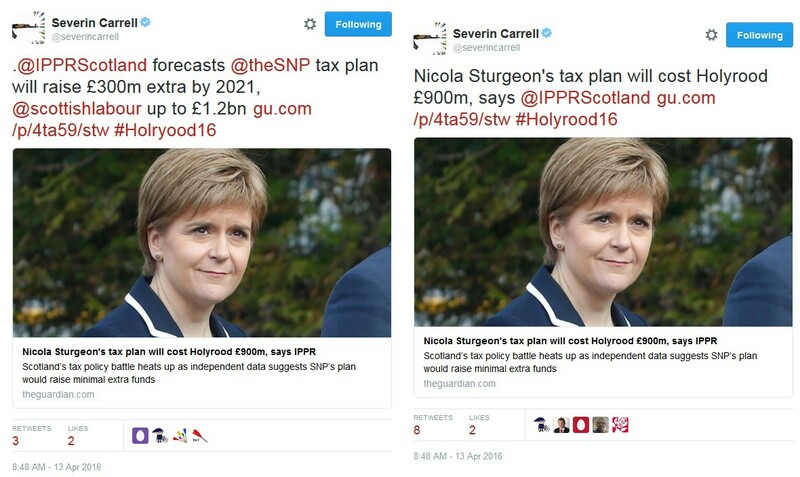 Because in the Scottish media, every day is Groundhog Day.